So, I’m going to go about this backwards. Normally I talk about the main course of a DVD release first and then look at the bonus stuff. Well, I hadn’t realized when I started to watch this DVD that it was, in fact, a double disc set. So, with the main disc hidden behind the booklet, I pulled out the second disc and popped it in. That disc is “Play,” a disc that includes all of Gabriel’s best music videos ranging from more modern stuff to the classics. That’s a great disc and includes some cool bonus stuff of its own. By itself it would be worth buying. The thing is, that’s just a bonus added to this set. That really tells you how great this thing is. So, what about the main disc? 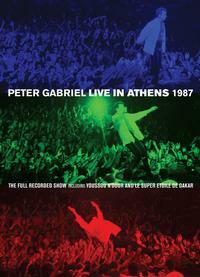 Well, this concert performance was filmed during Gabriel’s So tour. Based on the strength of the singles from that album, Gabriel had risen to superstar status. It was sort of a fluke. I mean, that kind of pop stardom wasn’t something that was to stick with Gabriel. That made this massive concert experience basically a once in a lifetime event. One thing I found a little odd, and I’m not sure if it’s a good thing or not is the inclusion of Youssou N'Dour's five song opening set. Since Gabriel introduces them and seems to genuinely be on about them, I would guess he hand picked them for the spot. That gives it some relevance. I just think maybe it should have been included as a bonus section that you could watch or not, rather than something at the beginning you have to skip through if you don’t want to see it. As to Gabriel’s set, the band were on top of their game. Of course, one thing about this band is that they are always professional. These guys can play and are among the best in the game. So, that level of professionalism is a given. The concert is great, even if it looks a bit dated in retrospective. It was filmed professionally, so while its not up to modern standards in terms of video and audio, it’s still quite good. The bottom line is, if you just got either one of these discs, it would be well worth having. The combination of the two, though, makes this thing a “must have” for any Gabriel fans. Get out there and buy this thing as fast as you can. It may not be perfect, but it's great. Besides, the warts add some character and charm to it.